you will be working in the spaces (not the stitches themselves)! R1: Create a MR, ch 3, 1 dc, ch 1, (2 dc, ch 1) five times. Join with a sl st to the top of the initial ch 3, finish off and weave in ends. R2: Join new colour with a sl st, ch 3, work 3 dc all in the first ch1sp. Work 4 dc in each ch1sp around. You will have 6 sets of 4 dc stitches when you are finished this round. Sl st to the top of the initial ch 3 to join. Finish off and weave in ends. R3: You will be working in the spaces between each set of 4 dc stitches. Join new colour with a sl st, ch 3, 4 dc all in the space between two sets of 4 dc sts. Now, work 5 dc sts in the space between each set of 4 dc sts around. You will have 6 sets of 5 dc sts when you are finished this round. Sl st to the top of the initial ch 3 to join. Finish off and weave in ends. 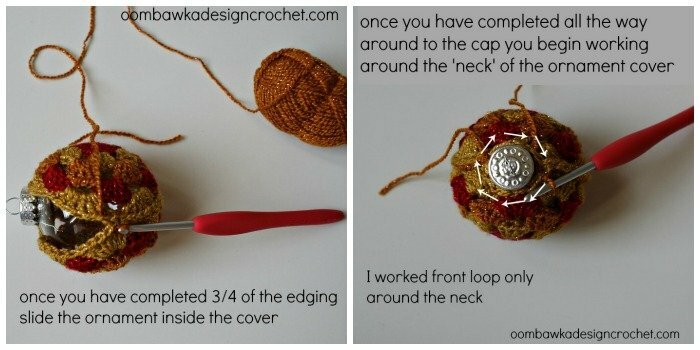 The cap will be starting to curve into the same shape as the ornament – this is ok! R4: You will be working in the spaces between the sets of 5 dc stitches. Join new colour with a sl st, ch 3, 5 dc all in the space between two sets of 5 dc sts. Now, work 6 dc sts in the space between each set of 5 dc sts around. You will have 6 sets of 6 dc sts when you are finished this round. Sl st to the top of the initial ch 3 to join. Finish off and weave in ends. R5: You will be working in the spaces between the sets of 6 dc stitches. Join new colour with a sl st, ch 3, 6 dc all in the space between two sets of 6 dc sts. Now, work 7 dc sts in the space between each set of 6 dc sts around. You will have 6 sets of 7 dc sts when you are finished this round. Sl st to the top of the initial ch 3 to join. Finish off and weave in ends. Place wrong sides together (right sides facing out – i.e. 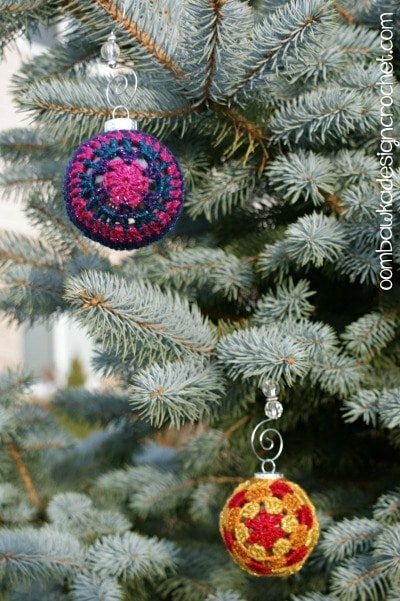 the sides you want to show on the outside of the ornament) and join new colour of yarn with a slip stitch in both loops of the top motif and the the bottom motif. Work a slip stitch through bother layers of the motif, around the motif, until you have joined 3/4s of the way around. Slip the plastic ornament inside the partially closed ornament cover and continue to sl st up to the very top of the ornament – by the metal cap and neck of the ball. 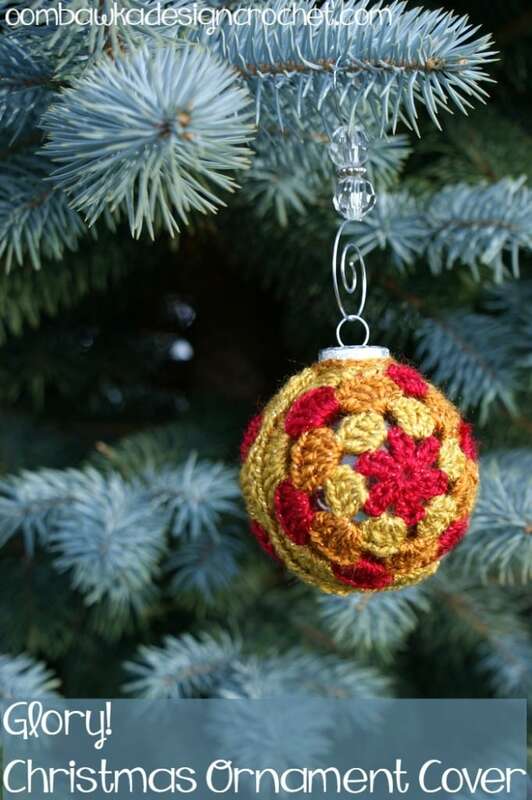 Now sl st around the neckline of the ornament (think of it like a sweater) in the front loop (the loop closest to you) of each stitch to create a finished upper edge. 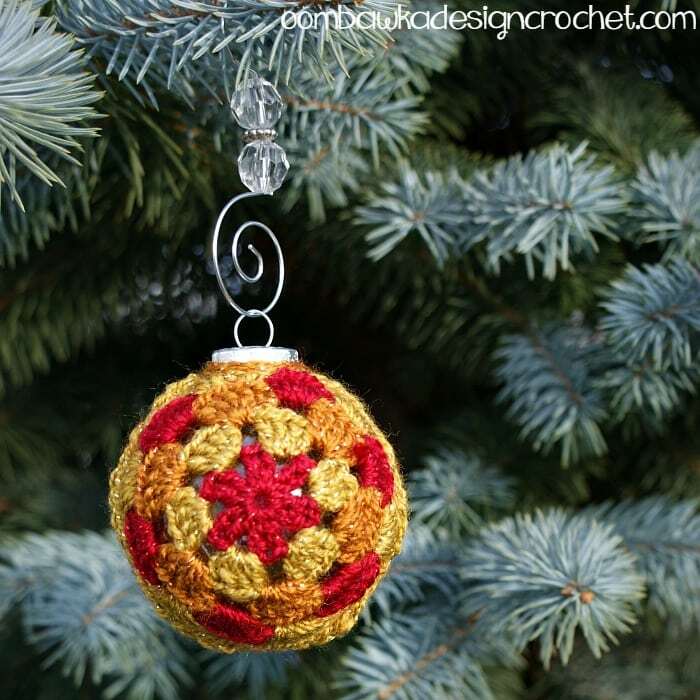 Do you grant permission to make these ornaments for sale? 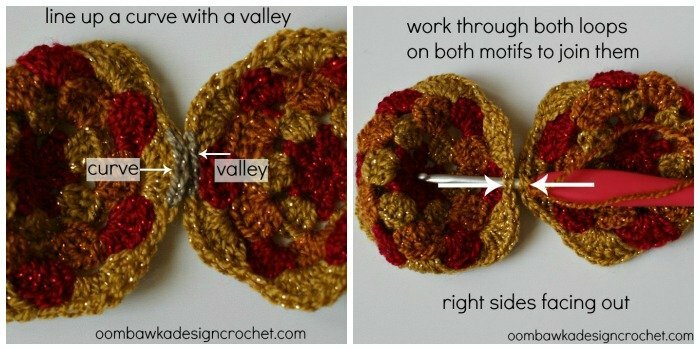 This is my favorite free pattern. I love this. I have clear bulbs in a box that have not been hung on the tree. They were waiting for this pattern. Thank you.